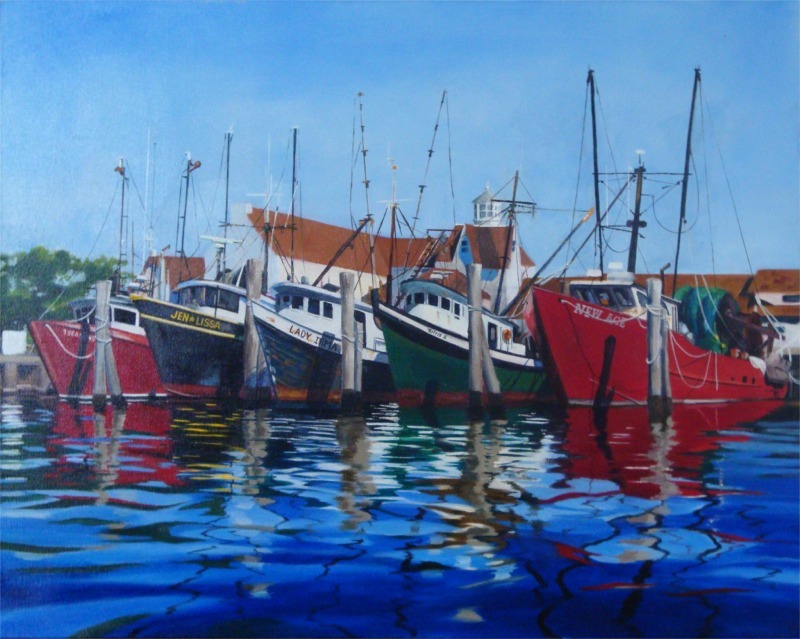 “Silvia S” - This is an early morning scene with working fishing boats in Montauk, New York. I particularly enjoy Marc's work because his methods are very similar to my own, though our personal styles vary widely. I respect the amount of time and research that goes into conceptual work of this caliber, and enjoy Marc's penchant for snarky and confrontational themes and methods. As an illustrator myself, I particularly enjoy art that tells a story or depicts an ideology. For too long, the left has had a stranglehold on the culture and the right has been complicit through complacency. Marc sees a need for a broader voice in the cultural arena, making his art a perfect fit for our goals - we are a close-knit group devoted to broadening the range of ideas expressed in art and promoting an aesthetic standard that has been broken down by the self-aggrandizing elites of the status-quo in the arts. “Master one style and repeat it”, is the conventional wisdom espoused to most artists as they navigate the slippery world of Fine Art. That doesn’t work for me. I am too empathetic to the downward-spiraling world of the 21st century to just paint pretty pictures and hope to make a buck. I DO paint pretty pictures to make a living, but when I cannot stand to hear about one more corrupt politician, one more race-baiting loudmouth or one more self-righteous climate preacher, I simply MUST use my talent to comment on it all. I believe God gave me this talent and my particular not-so-quiet temperament to illustrate for people the moral decay infecting our modern world. Oops! Did I say God? I meant the non-denominational non-judgmental spiritual entity or nature deity of your choice. See, I just can’t help myself. Apparently the Lord put a little “snarky” in with all that “talent”, (emoticon here). When working on a commentary piece, I use whatever medium/genre I feel will best fit the particular message I am trying to convey. I do not limit myself with one particular style. I need to be as graphic and impactful as I can be in that moment. This immediacy does not preclude my researching said subjects thoroughly. I use as much information from as many sources as possible to build an accurate narrative. Getting all of this information/passion to fit together on a 2 dimensional surface and still be visually pleasing is a challenge I enjoy immensely. I also enjoy watching those who have had a monopoly on visual political commentary squirm when they see my work. It is time to shatter the old stereotypes. It is time to have fun. It is time to be loud and shout from the rooftop that art can change the world in a Conservative/Libertarian way. It is time to prove that all of the great creative minds are NOT on the LEFT. I do not subscribe to some of his extreme views, but the way he tells his story visually, is impressive. Your artistic talent is amazing, and the message depicted is powerful. Marc is one of the most talented artists around. His eye for detail and his heart for true and meaningful expression of thought shines through in his art. I have seen his political art as well and it portrays the angst many of us feel in response to our government's overreaching actions. I hope you will take the opportunity to check out all of his artwork. The artwork is fantastic, a treasure In its own right. The fact that the artist has traditional values is the icing on an otherwise excellent cake. Thank you to Frances Byrd and FreedomWorks. See the hard-hitting political work on LIBERATCHIK. Click "SEE MORE AT LIBERTCHIK".